Born in Manchester, England, and now a Los Angeles resident, Petty is the lead singer and vocalist, and primary songwriter, of Minibar, whose debut album was released last month on Universal. After just one listening, the songs on Road Movies will get stuck in your head -- in a good way. The instantly hummable rock tunes also manage to be heartfelt and witty at the same time. That's no mean feat in our ironic, cruel, post-modern world. On Friday, Minibar opens for the Old 97s at Slim's. The band previously has toured on bills with Wilco and the Jayhawks. In fact, Petty calls the Wilco gig at the Fillmore last year "the best day of my life." Though Petty doesn't mind his music being lumped in with the no depression-alt country-roots rock crowd, this is how he describes Road Movies: "It's meant to be a pop record." Indeed. Petty says his first and foremost musical influence is the Beatles; and while Minibar's songs certainly don't rip off the world's quintessential rock band, they do have that fun-to-listen-to-yet-meaningful quality the Fab Four perfected. And they're from England, too. Oddly enough, Petty and his mates Sid Jordan (bass, piano, vocals), Tim Walker (guitars, banjo, mandolin, vocals) and Malcolm Cross (drums, keyboards, vocals) couldn't get a decent gig in London, where they toiled playing small clubs for years. It took coming to American to find fortune. And fame, they hope. "We were kind of at the tail end of Brit-pop, and we didn't make sense to anybody," says Petty, talking about failed attempts to get a record deal in Europe. "We just kind of came out here on spec. We never really thought we'd end up here," he adds, speaking in a phone interview from Los Angeles, where he's lived for two years. The band arranged a few dates in L.A., and came west with only enough cash for a two-week stay at a hotel called (prophetically enough) Le R�ve. ("The dream," for non-French speakers.) But things changed after a representative from Cherry Entertainment, a division of Universal, heard the group at the Viper Room. Soon they were called up to the office, and signed. The band continued on its roll, procuring prolific pop producer T-Bone Burnett for the album after liking his work with The Wallflowers. Among Burnett's greatest contributions was the warmth he created, according to Petty, who called the groups's pre-Burnett sound "clean, but a bit dead." 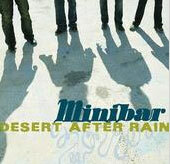 But Minibar's songs are anything but that. Talking about the poignant tune, "I Know Without Asking," Petty admits, "It's hard to write a song about friendship without sounding trite," and adds, "It was a genuine feeling. There's an unspoken bond between people who know each other well." Petty also subscribes to the wry British songwriting school, which advances this theory about song topics: "You can take this; there's a knowing look behind it; it means that it sounds true." Petty's composition skills, however, weren't in demand during much of the years he spent in London. To support himself and his burgeoning music career, he and Jordan had a job three nights a week doing covers in pubs. "That's where we learned the harmony thing," he says. Through the years, Petty, 33, ("too old," he chuckles), has dabbled outside music. He sold ice cream in Australia, counseled at a heroin rehab clinic in London, got an English degree and did voiceover work on ski reports. What a contrast to life in L.A.
"Everything's sunshine and dreams come true," Petty says, without even a hint of sarcasm. "Everything I've worked for my whole life has has happened since I came here." In fact, the songs on Road Movies, particularly the title track, reflect Petty and the band's journey from England to Southern California. With references to earthquakes and song titles like "Sheer Volume of Traffic," one might assume that the album evolved as a response to living in L.A. Yet most of songs actually were written before the band's arrival in the States. Petty says, "It was some kind of weird, self-fulfilling prophecy."